Mobile app development is all the rage with Statista predicting that mobile applications might generate around $189 billion in global revenues by 2020. As the world’s population is increasingly getting mobile, people are getting more done with a touch of the thumb. Naturally, the need for mobile app development services is increasing, and developers are looking for newer, more efficient, and faster ways of deploying and developing mobile apps. This has led to a search for the best mobile application development platforms. Businesses today need to reach all mobile app platforms in order to cover a majority of their audience. And, to make this possible with less effort for developers is like a dream come true. Pitching one mobile app for both iOS and Android might seem like a hassle to businesses trying to cover their market user using both platforms. But, a comparatively recent technology has eased the process for companies. React Native is a framework created by Facebook in 2015. The framework eliminates the need to develop similarly functioning mobile apps separately for multiple platforms. React Native is based on the principles that were already in use with the release of React.js. With React Native, all you need is a single codebase to develop seamless experiences for both leading platforms (iOS and Android) without compromising on the UI and UX front. In 2012, Mark Zuckerberg once commented, “The biggest mistake we made as a company was betting too much on HTML5 as opposed to native”. React Native was then announced by Facebook at its React.js conference in Feb 2015 and was open-sourced in March the same year. Popular applications such as Instagram, Facebook, Uber, Pinterest, Discord, SoundCloud, Bloomberg, Airbnb, Skype, etc., are entirely or partially written in React Native. 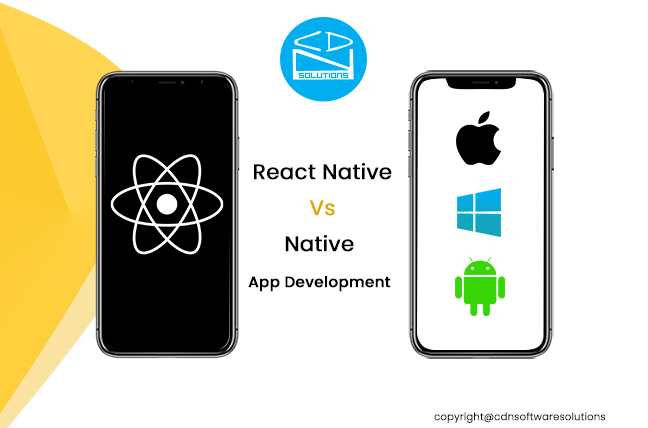 Additionally, the most prominent businesses today realize the potential in React Native to get their mobile application up and running in no time and across a wide audience. But, would React Native work for you? If yes, what are the benefits of this mobile application development platform over others? What features differentiate React Native from Native mobile app development? Reloading and Revising – Anyone who has experienced working with XCode or Android Studio will swear build times are long, hard, and tedious. When a mobile app is almost done and you need a small change in it, it can get especially frustrating for the developer to make the change and test it again and again with a long build time. React Native solves this through hot reloading, which keeps the app running while saving its state and injecting the changes as and when you make them. For this reason, React Native is a leading choice for a mobile app development platform for developers. User Interface – React Native uses Flexbox to structure the UI of its mobile apps. Flexbox is very popular in the mobile development landscape for creating responsive web and mobile UIs easily. Another considerable advantage of React Native is that the technology allows you to have access to all native APIs such as camera, touch IDs and GPS. But, React Native does not provide the amount of UI power that comes with a Native mobile app. Therefore, if an app needs complex animations or highly sophisticated UI, React Native might not be the best choice. But, for all other advantages of React Native and a simple-yet-elegant looking mobile app, React Native is the way to go. Native modules – Even though React Native might cover a large number of cross-platform use cases, it might be impossible for it to cater to all the Native mobile app requirements. Which means, there might always be a need for Native modules. Native modules are snippets of code written in Native language which handle a specific Native feature. If and when developers want to use these modules, they can link them with react-native link command, and/or follow a few instructions for them to work on both iOS and Android. These are the leading features of apps developed using React Native. Summing up the Difference- React Native or Native Mobile App Development? You want to deliver your app to your market sooner than can be possibly done with Native mobile app development. You want to make a similar application available at the same time to iOS and Android users in your audience. You house a small development team with five developers or less instead of a team with, say, ten developers. You don’t want complex UX or sophisticated animation in your app. You want testers to spend less time on regression tests. You want to resolve bugs quickly. You don’t want to utilize highly platform-specific features either on Android or iOS mobile app development platform. You need to make an app only for iOS or only for Android. You need a highly complex app which uses a huge chunk of platform-specific code. You want to maintain the app over a long period without the fear that Facebook might take down React Native any time soon. You want your app to support new OS features as soon as they get rolled out. React Native and Native mobile app development answer different needs and should be distinctly used in scenarios. React Native is the perfect choice for businesses with a crunched budget, short timeline, and the need to roll out a mobile app with acceptable and simple UI and features to both leading OS users. For 18+ years, we have worked with offshore companies in industries including but not limited to gaming, oil & gas, e-learning, entertainment, enterprise, and real estate. Our expert developers and consultants analyze your mobile app requirement from a 360-degree point of view. We can help you chalk out the course for mobile app development, roll out a strategy, and implement it seamlessly. We have been the pioneers in experimenting with the latest tech such as AR, VR, artificial intelligence, the blockchain, the Internet of Things, Beacon services and so on. Our expert designers can bring your app experience to life with the right blend of art and technology. You only get one chance to leave a good first impression. We help you win that chance through immersive mobile experiences and apps that are functional and feature-rich. For a native or React Native mobile app requirement, reach out to us at sales@cdnmobilesolutions.com and we will reach you shortly.